Biosecurity, Quarantine and Record Keeping | K.O.I. Very well laid out program. By the time I finished I felt I understood it. To me, this was the easiest chapter thus far. The material included a great deal of common sense, but it also delved into specific pros and cons of various chemicals used. One of the most helpful things to me was to clearly explain the entire concept behind quarantining fish... what it is, and what it is not… and how to accomplish it effectively and in a practical manner. Again, the instructor was extremely responsive and helpful. A real pleasure to work with. A nice concise course that introduces good practices to the student. Awesome course describing how to safely quarantine new fish and plants, how to sterilize tanks and equipment. You'll also learn how to keep your "koi area" secure from pathogens. Very clear, educational and straightforward. I like the flow of this course from start to finish, easy to understand and full of good tips and ideas. There is a lot of useful and detailed information in this class. It has taught me a good lesson about the spread of pathogens, which I had never thought about. I had no idea that disinfecting pond equipment and quarantining all new living things I bring into my pond was so important. Thank you, Spike Cover, for writing this great course and being so patient in reviewing my test! 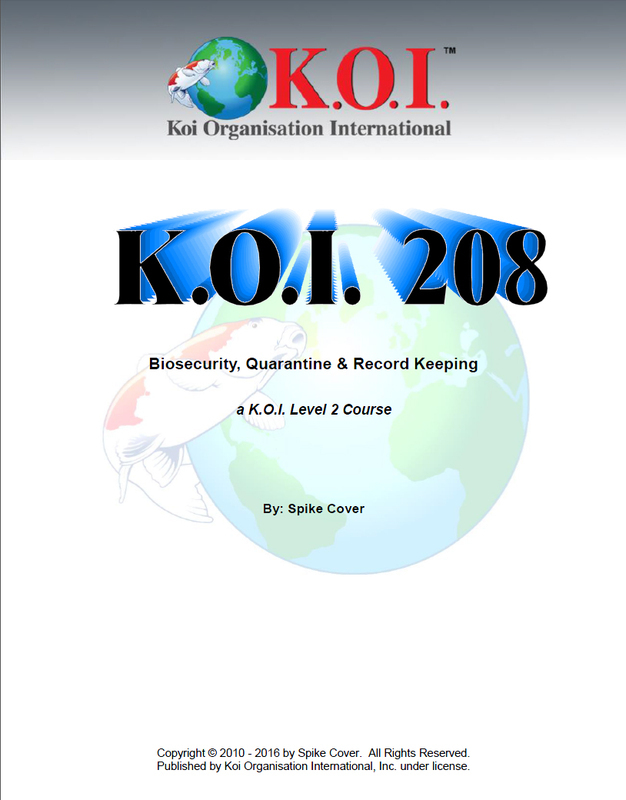 The course text is a document entitled Koi Biosecurity, Quarantine & Record Keeping by Spike Cover. A written test will be given at the end of the course. To complete this course, students must provide satisfactory answers on all exams within 12 months of the initial instructor contact.